This sublease includes optional provisions that give the head landlord additional rights when dealing with the subtenant. It can be used to sublet part of or the whole of any commercial property, including offices, shops, industrial units such as factories, warehouses and workshops, and land. Sometimes a landlord may allow subletting, but require further restrictions or obligations on the subtenant. The most useful of these is the ability to "bypass" the sublessor and deal directly with the subtenant if necessary. By setting these terms, the head landlord can proceed without the necessity of establishing the sublessor's default in court. When someone wants to litigate, nothing can be certain. 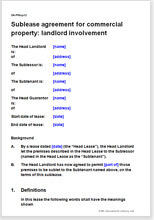 But the sublessor cannot sign to this sublease then later deny the head landlord's rights. Your sublease can follow or deviate from the original terms as much as you like. You could carve out the sublease from the head lease with the same terms, or alternatively, specify different terms and impose further obligations on the new tenant. If you are subletting only part of the property you will need to look afresh at how responsibilities such as service provision, access, insurance and so on are split between the landlord, you the sublessor and your subtenants. We provide for many different possible options. This is a very flexible document. The sublessor should first check the original lease. Subletting may be allowed and if so, the permission is likely to be subject to specific conditions. If not allowed, it may be possible, with the landlord's consent, incorporate terms in the landlord's favour in return for allowing subletting. In balancing the codes with the law and the landlord's interest landlord, we have tried to comply with the codes but nevertheless, have favoured protecting the landlord where there may be a difference. We offer two subleases. This version has been drawn for circumstances where the landlord requires deeper and more detailed involvement in the relationship between himself and the new subtenant. If you don't need these provisions, you may be interested to look at this alternative commercial property underlease agreement. If (and only if) the term of your sublease is for more than seven years, it must be registered with the Land Registry. We provide prescribed lease clauses (PLCs) for long term leases free of charge for download here. We include instructions on how to add these to your sublease. The law governing commercial leases is substantially different in Scotland as compared with England, Wales and Northern Ireland. There is little legislation or case law relating to leases in Scotland. So the version we have drawn for our Scottish user is common law based. For the Scottish version of this sublease please select "Scotland" from the list in top box.